Imagine a carbon sheet that's only one atom thick but is stronger than diamond and conducts electricity 100 times faster than the silicon in computer chips. That's graphene, the latest wonder material coming out of science laboratories around the world. It's creating tremendous buzz among physicists, chemists and electronic engineers. "It is the thinnest known material in the universe, and the strongest ever measured," Andre Geim, a physicist at the University of Manchester, England, wrote in the June 19 issue of the journal Science. "A few grams could cover a football field," said Rod Ruoff, a graphene researcher at the University of Texas, Austin, in an e-mail. A gram is about 1/30th of an ounce. Like diamond, graphene is pure carbon. It forms a six-sided mesh of atoms that, through an electron microscope, looks like a honeycomb or piece of chicken wire. Despite its strength, it's as flexible as plastic wrap and can be bent, folded or rolled up like a scroll. Replacing silicon, the basic electronic material in computer chips, however, "is a long way off ... far beyond the horizon," said Geim, who first discovered how to produce graphene five years ago. "In the near- and medium-term, it's going to be extremely difficult for graphene to displace silicon as the main material in computer electronics," said Tomas Palacios, a graphene researcher at the Massachusetts Institute of Technology. "Silicon is a multibillion-dollar industry that has been perfecting silicon processing for 40 years." Government and university laboratories, long-established companies such as IBM, and small start-ups are working to solve difficult problems in making graphene and turning it into useful products. Ruoff founded a company in Austin called Graphene Energy, which is seeking ways to store renewable energy from solar cells or the energy captured from braking in autos. The Pentagon is also interested in this new high-tech material. The Defense Advanced Research Projects Agency is spending $22 million on research to make computer chips and transistors out of graphene. Graphene was the leading topic at the annual meeting of the American Physical Society _ a leading organization of physicists _ in Pittsburgh in April. Researchers packed 23 panel sessions on the topic. About 1,500 scientific papers on graphene were published in 2008 alone. Until last year, the only way to make graphene was to mount flakes of graphite on sticky tape and separate a single layer by carefully peeling away the tape. They called it the "Scotch Tape technique." 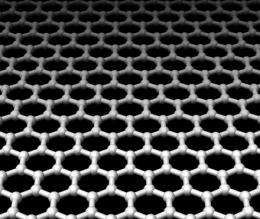 Recently, however, scientists have discovered a more efficient way to produce graphene on an underlying base of copper, nickel or silicon, which subsequently is etched away. "There has been spectacular progress in the last two or three months," Geim reported in the journal Science. "Challenges that looked so daunting just two years ago have suddenly shrunk, if not evaporated." "I'm confident there will be many commercial applications," Ruoff said. "We will begin to see hybrid devices -- mostly made from silicon, but with a critical part of the device being graphene -- in niche applications." uhh 3 years too late on the article? if it is stronger than diamonds and lighter than a feather surely the The Defense Advanced Research Projects Agency would also be looking at it as a bullet catcher in soldier garments too. Hate to break it to you, but the best wearable ballistic armor is very deformable and does "travel" into the body. You end up with a nasty bruise, even a broken rib, but at least it's not causing massive penetrative tissue trauma. Besides, I stated it probably wasn't a very applicable use. Are you kidding? Do some research, rigid armor is outmoded, especially in body armor and even in vehicles. You have to distribute the energy (allow the projectile to move some and/or the armor), simply trying to stop it dead is not near as effective in saving lives and minimizing damage. Gee, thanks for that bit of enlightenment there, Einstein. However, there's deformable and then there's deformable. Bending enough to give a bruise is one thing; traveling into the body together with the bullet, is something else. Most effective armor couples tensile elements with rigid elements (such as ceramic plates.) The rigid elements are meant to fragment the bullet and distribute its force of impact over a wide area; the tensile elements are intended to catch the fragmenting debris. You have to distribute the energy (allow the projectile to move some and/or the armor), simply trying to stop it dead is not near as effective in saving lives and minimizing damage. The gun that fires the projectile seems to be rigid enough to me. If one can launch a projectile with a rigid device, the symmetry of Newton's laws of motion would suggest that one can stop that same projectile with an equally rigid device -- and with no more of a "kick" than there was due to the original launching. Not even any nasty bruises required. the symmetry of Newton's laws of motion would suggest that one can stop that same projectile with an equally rigid device -- and with no more of a "kick" than there was due to the original launching. Achieve this with minimal weight and maximum capability for movement and you're a millionaire, Pink. Good luck. Join PhysOrg on electronic piece1. Follow PhysOrg on electronic piece10000000000000000000000000. Believe it or not, diamonds can be grown into plates and other shapes. There is some top secret research being conducted at undisclosed locations as we write what we do. Some of the diamonds that are grown have even been tested by a jeweller and was virtually indistinguishable from a natural diamond.